The College of Design Laptop Program helps Design Students purchase, use, and have assistance with maintaining their own laptop computers. This plan allows the studio and computer lab to be joined and portable. Curricula and coursework continue to be revised to optimize integrated learning with digital technology. The Design Laptop Program offers an option for mobility, and is usable anywhere within the College, or from a remote location via networking. This helps make the design studio technology environment rich, portable, and accessible. 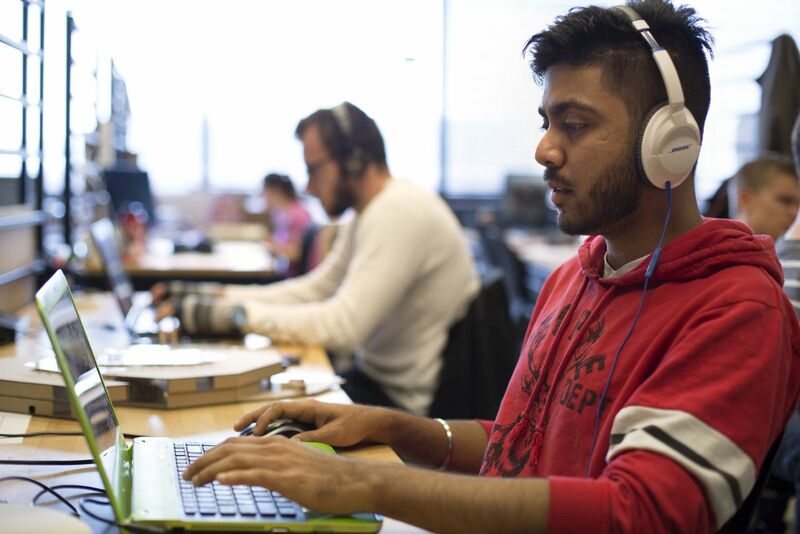 After completing the Core, undergraduate students admitted into a Design major and Design graduate programs are presented with the opportunity to purchase a laptop through the College. Repayment is made to the College of Design for the included materials over a period of three academic years, rather than a high up-front expense. Why should I have a laptop? While we can’t require that you purchase or own a laptop, many of the degree programs believe that ownership of a correctly configured laptop is critical to your educational success. We offer this program as a financially advantageous way for students to obtain, own and operate their computers. You will also have access to support if and when things go wrong. This program utilizes group buying power to provide a high-end machine at a better price than you could typically obtain when purchasing a laptop individually. The included information from your new department lists the minimum and recommended computer requirements for that area. The college’s program meets or exceeds all recommended requirements. No, this is a special program the college offers that allows students to completely pay for the computer and included software and accessories over a three-year term. It is yours to make use of during the agreement, but we do maintain ownership of the machines during the term of the contract so that certain software programs the College of Design owns can legally be installed and maintained. What kind of machine will I get? Warranty: 3-year Extended AppleCare+ warranty, automatically enrolled. 2-Terabyte portable external hard drive for data backups and extra storage. What software comes with the program, installed on the machine? Microsoft Office and Trimble Sketchup Pro are the primary software packages purchased and installed under the Design Laptop Program contract. Microsoft Office includes Word, Excel, PowerPoint and more. A personal license for Microsoft Office will be provided at the end of the program to be used for the remainder of the laptop’s life-cycle. The Laptop Program also includes the Adobe Creative Cloud Applications (Adobe Photoshop, Illustrator, InDesign, and more, refer to the fine print appendix for the current list of provided applications.) The Adobe programs available are currently identical to what are offered in the computer labs. The Adobe Creative Cloud Applications are the most commonly used software applications in this college and the industry. You will almost certainly use one (or likely more) of these products throughout your design education and career. These applications were once called the ‘Adobe Suite’ and were sold as ‘full-packages’ or with a purchase-once-use-forever license. Over the past few years, Adobe has transitioned to the ‘Creative Cloud’, a subscription-based license or a pay-per-month/year-for-access license. While we are able to offer the majority of, and most often used, applications with the laptop program, we are unable to provide a subscription account with the Laptop Program. There are some features included with the Adobe Creative Cloud that are not currently supported with the provided installation. Some of these include Adobe TypeKit, Adobe Portfolio, Adobe Stock, Android or iPhone apps, and beta/preview applications. This list may expand or shrink as time depending on any changes made by Adobe. Some classes may require use of these newer features not included with the Laptop Program. In these instances, you will have to purchase your own student subscription, for the duration you require, from Adobe to gain access to those features. All of these software packages are compatible with either Mac OS or Windows OS. The laptop program will support these software packages and the installed operating systems, including upgrade availability through our support staff. Autodesk software titles such as AutoCAD Architecture, 3D Studio Max and Revit may be installed on the Windows OS partition at no additional cost. Select Autodesk titles may also be available for Mac OS. Can I install my own software on the machine? Sure. You will be a local administrator on the machine with full access. Third-party software legally purchased by you or provided by your department can be installed at your discretion during or after the contract term. We will assist in any way we can, but we can’t guarantee support for third-party software licenses outside the scope of the Design Laptop Program. Why are there only Apple laptops in the program? The Intel-based Apple MacBook Pro laptops are capable of running either Mac OS or Windows OS. This means that can choose to have your machine set up as a Windows PC, which is the OS that will start up and run by default. You may specify the option of starting the machine in either operating system or you can choose to exclusively prefer one operating system to the other. MacBook Pro laptops tend to be among the most versatile performance mobile workstations, with up-to-date technology and high-quality design. They are technically very similar to Intel-based PC brands of hardware. When running Windows OS directly, they operate as any Windows PC laptop would operate, with similar performance. For all technical intents and purposes, a MacBook Pro running Microsoft Windows OS is a “PC” laptop. Which Operating System configuration should I indicate? It ultimately comes down to what you are comfortable with and prefer to use. Because MacBook Pro laptops can use multiple operating systems, the only things you must decide are whether to have the machine include Windows OS and whether to favor Mac OS or Windows OS. Windows OS, either as primary or secondary OS, is usually needed for Autodesk software compatibility, which coursework in some of the programs requires. The configuration can be changed after delivery, with some downtime involved, by the Laptop Program Coordinator if your needs or preferences change. Some College of Design departments and programs have specified a preferred OS platform for their students. The Architecture, Community & Regional Planning, Industrial Design, Interior Design and Landscape Architecture departments recommend inclusion of the Windows OS platform. Windows OS on MacBook Pro laptops can be configured for compatibility with applications such as Autodesk AutoCAD Architecture, Revit and 3DS Max. Industrial Design students also use Solidworks and Keyshot software, which are provided by that department independently of the Design Laptop Program. Both Solidworks and Keyshot software require a Windows OS. What do I keep when the program is over? At the end of the contract term (three years) you will have fully paid off the machine, accessories and software packages included in the purchase price. After paying a small transfer fee ($5), the machine’s ownership will be transferred to you. The price for a one-year extension to Microsoft Office is built into the contract. We will, of course, do our best to honor that agreement as part of the contract; however, companies often change their licensing contracts and we can’t always anticipate what will happen three years into the future. In the event that we can’t fulfill the software requirements, that money will be credited back on the final statement. What happens if I need longer than three years to complete my degree? No worries. Machines can continue to be supported by the program for an additional year while you finish your degree. When you are ready to graduate, we will transfer ownership and complete the contract as outlined above. There are certain benefits that can’t be extended beyond the original three years. As an example, the AppleCare+ Warranty cannot be extended past the included three years. OK, I’ve read this far… So, how much does all of this cost? The cost will be $600 per semester for six semesters. The payment will be assessed to your UBill, and your financial aid may be used to make the payments. The Design Laptop Program does not handle cash directly; all receivables will be handled through the ISU Treasurer’s Office. That seems like a LOT of money…why? This program is meant to be a better value than direct retail purchasing of the same or similar specification equipment, not necessarily the least expensive product on the market. We expect that you will need to effectively use this machine for at least three years, and it is important that it is still capable of running the latest software then as well as now. In that light, we try to make the program high-value rather than low-cost. We run this program on a cost-recovery basis only, not to make a profit for the college or university. The cost covers many included goods and services. The purpose of the program is to make high-performance digital tools more affordable with bulk-pricing advantages and to defray that substantial cost over time. Please remember that you are buying a top-end, custom-configured computer, factory warranty, insurance, factored-in financing costs, accessories and software, all of which you keep at the end of the contract. These computers are far more powerful than the entry-level laptops you may see advertised for low sale prices. Please also keep in mind that software subscriptions such as the Adobe suite can get expensive. The student subscription cost for Adobe Creative Cloud is $249 for the first year and $360 for each subsequent year. That totals $969 for three years, or $1329 for a four-year professional program like Architecture or Landscape Architecture. Although some classes may require the cloud features of a subscribed Adobe Creative Cloud account, the Design Laptop Program includes the major and most commonly used applications included in the Adobe Creative Cloud at no cost. If my Design Laptop Program laptop breaks, what do I do? We have a full-time technician and coordinator dedicated to supporting the laptop program. Mitch Versteeg is available to help troubleshoot and resolve software problems, arrange hardware-related repairs, re-install programs, or whatever might be necessary to return your computer to working condition. His contact information is included at the end of this letter. What if I drop my machine or it is stolen? The college purchases insurance for each unit, which is included in the program costs. The deductible for any and all claims is $500. AppleCare+ Warranty does include two incidents of accidental damage repair at a reduced cost (~$100 for screen, ~$300 for “body.” Repairs can be expensive, so please handle with care! If my machine needs to go into service, do I get a loaner? We do have a limited number of loaners available for use while repairs are being completed. We will make every effort to get a machine into a student’s hands, but we can’t make that guarantee. The college computer labs will be available for use, and there are several options on campus for short-term laptop checkout if a loaner is not available at a particular time. What happens if I decide to leave the university before the end of the program? You have two options, defined by the agreement contract terms. – The first option would be to find another eligible design student to take over the computer, accessories, contract obligations and payments on your behalf. – The second option is to purchase the remaining contract balance outright. If I already have a laptop or I want to purchase my own, can I still get software or support from this program? We can only support machines that are in the Design Laptop Program due to software restrictions and configuration issues. TechCYte at the University Bookstore is a source for purchasing software and university IT Computer Services can perform hardware and software support (at a cost) for a personally purchased unit not in the Design Laptop Program.